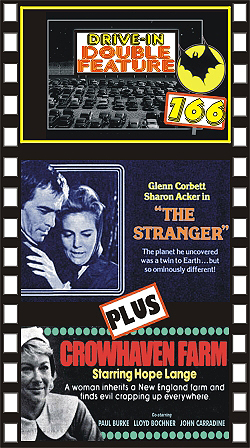 THE STRANGER (1973) Glenn Corbett, Cameron Mitchell, Lew Ayres, Sharon Acker, Dean Jagger. After a mishap in space Corbett finds himself in a strange hospital where no one can give him any answers. After escaping, he realizes he’s not on Earth when he sees two moons in the sky! This planet’s government stamps out all perceived threats by assassination. Mitchell is a security chief who tries to hunt Corbett down and kill him. Can Corbett find his way back to Earth? Nice color, 16mm. PLUS: CROWHAVEN FARM (1970) Hope Lange, Paul Burke, John Carradine, Lloyd Bochner. Lange and hubby inherit a strange old farm. She soon sees visions of ancient settlers doing weird things with rocks and wooden doors. The neighbors spin tales of witchcraft. Soon Lange becomes aware that something is amiss. Carradine is great as a sinister handyman. A creepy film with an unsettling feeling of impending horror. One of the best films about witchcraft you’ll ever see. Great color, 16mm.